At the start of the Eurozone crisis in 2010 we noted Europe was at a cross roads (1) - it could take the road of economic and political integration or the road to collapse of the Euro and with this the entire European project. Of course the European ruling classes, in particular Germany and France, always understood that this was the case, yet there was reluctance to take decisive steps towards integration. This vacillation was due to residual nationalism in the member states and fear of a German-dominated Europe. However, under the relentless blows of the crisis many of the European bourgeoisie have realised that there is now no alternative. The last 9 months have seen it take decisive steps on the path to political integration. The key event was the European Central Bank’s (ECB) statement in July that it would buy unlimited quantities of government bonds to support the Euro. The technical details of these purchases, which are called Outright Monetary Transactions (OMT) were finalised in September. They of course come with a lot of conditions. The country requesting such support must request a loan from the newly established European Stability Mechanism (ESM) (2) and then submit to fiscal and budget supervision and a “macro-economic stability programme.” The last condition sounds much like the austerity programmes foisted on Greece, Ireland and Portugal. As the crisis intensified there have been a succession of documents from the European Commission (EC) and summits of European leaders calling for greater unity and integration. The most significant documents from the EC have been those issued in September and November. In September the EC called for a banking union within the Eurozone, and in November it called for the Eurozone to provide itself with powers to create a common treasury, to tax and to produce common bonds for all Eurozone states, the so-called Eurobonds. In December the first step in implementing the proposals contained in these documents was taken by a European summit which agreed to create a European banking union which would supervise Europe’s 200 largest banks. These moves have restored international confidence in the Euro and the European project. Indications of this are that capital has started to flow into Europe’s peripheral states and these states have again been able to borrow on the international capital markets. In the last 4 months of 2012 the distressed states on the periphery of the Eurozone, Portugal, Ireland, Italy, Greece and Spain (the PIIGS) saw a net inflow of private capital of €92.7bn. This represents a massive change in assessment of global financial capital of these countries from the previous 8 months, in which there had been a net outflow of €406.4bn. Since the ECB pledge to buy short term bonds, interest rates on government bonds have fallen dramatically for all the PIIGS. In the last 4 months of the year all these states, even Greece, have successfully sold bonds on the international markets to fund government expenditure. Two recent studies, one from Allianz, the German financial services company, and another by the German bank Berenberg together with the Lisbon Council think tank, praise Greece, Spain, Portugal and Ireland for making progress in structural adjustment and note that their competitiveness is improving and that the current account deficits of Greece, Spain and Portugal have shrunk while Ireland is now running a surplus. The Berenberg report concludes the Eurozone could emerge from the crisis in 2014 with faster growth than its main competitors (3). Olli Rehn, the vice president of the European Commission, writing in the Financial Times on 11th December is similarly optimistic. Austerity is working. Ireland has returned to the debt markets, more capital is flowing into Spain than out of the country, Italy sold a 10 year bond at the lowest rate since 2010. Current account imbalances have fallen. Many of the measures which have rekindled confidence in the Eurozone were previously opposed by Germany and represent an apparent change in strategy. In October the IMF started to question the effectiveness of the austerity being imposed on Greece. It concluded that the debts could never be repaid without growth. At the Davos summit in January IMF chairman, Christine Lagarde, went further and said Europe needed a plan for growth. These statements represent an apparent break in the phalanx of the so-called troika of, the IMF, ECB and EU who supervise the loans to the bailout countries. This, together with the measures mentioned above, has not been rejected by Germany. In fact the German hawks have gone along with the ECB bond buying and a relaxation of the austerity regimes. This has been notable in the case of Greece. In November the ECB agreed to give up €15bn profit Greece should have paid it on its bonds. A further move was to lower the interest rate from Greek loans from 0.8% to 0.5% above the interbank rate and to return all profits the ECB makes from Greek debts to Greece. The time at which Greek debt to GDP is supposed to reach 115% is to be extended from 2020 to 2022 which will entail further losses for lenders. In November Greece was authorised to use €10.5bn of the latest bailout package to repurchase its debt on the open market. As the debt was trading at 30% of its face value this should allow Greece to write off about €35bn of debt. The German finance minister Wolfgang Schauble acknowledged that he and his Eurozone counterparts had agreed to further debt relief when the Greek primary budget reached a surplus (4). What has become of the steely-eyed financial disciplinarians of the Bundesbank? Is this a reversal of strategy or was it always intended to write down the debts and provide a stimulus for growth after the delinquent states had been whipped into shape? To answer this it is necessary to examine the position of Germany in the rapidly changing world economy. Germany is the largest economy in the EU accounting for over 25% of its GDP and the largest contributor to the EU budget and it is not surprising, therefore, that it is the key force in tackling the Euro crisis and driving the process of European integration. Germany is a major trading nation and its exports together with its imports make up about 90% of its Gross Domestic Product (GDP). It was the world’s top exporting nation between 2003 and 2008 and only lost this position to China in 2009. Even so exports have continued to rise and in 2011 Germany supplied 7.5% of the world’s exports and imports. In this year Germany ran a trade surplus with the world of €158.2bn, however, the importance of the EU to Germany is shown by the fact that €119.1bn or 75% of this was with the EU and of this while €80.3bn, approximately half the total, was with the Eurozone (5). The peripheral countries which have had to be bailed out or are approaching bailout are also important trading partners. Table 1 shows that of the €80.3bn surplus which Germany has with the Eurozone the PIIGS account for €23.6bn or 28% of the trade surplus. In addition to being markets Spain, Italy and Ireland are home to some $84bn of German foreign investment (6). The central European countries are now integrated into Germany’s supply chain. German stock of Foreign Direct Investment (FDI) in 2010 was $1.42tn which is approximately 3 times what it was in 2000, and over 60% of this was in the EU (7). These figures indicate the international nature of German capitalism but also the importance of the EU to it. However, the balance of world trade is changing and German capital needs to adjust to this. Since the early 90s Germany’s position as a global trading nation has suffered a steady relative decline. This has been caused by the rise of the Asian nations in particular China. China has become a key power in global capitalism and its share of world trade is now almost equal to that of the US. It is a major destination for foreign investment but also a major exporter of capital. In 2011 FDI flowing into China amounted to $111.9bn while capital exported was $77.2bn or approximately 70% of the capital brought into the country. It is no surprise, therefore, that the older developed capitalist states, in particular the US and Germany, are trying to reorient their trade towards China and to a lesser extend the other rising Asian economic powers. The economic structures of the two countries are reciprocally complementary rather than competitive. China’s comparative advantages in manufacture will complement Germany’s technological ones (9). When the ambassador speaks of China’s advantages in manufacturing he means, of course, the lower costs of labour power in China which are approximately 1/20 of those of the EU. Germany and the EU cannot compete in lower technical content manufacturing and must look for the future in more complex and sophisticated manufacturing. This can be achieved through incorporating lower value manufacturing in China into German high tech manufacturing. Germany is attempting to incorporate Chinese production into its supply chain and the increase in trade and deficit with China indicate the path the German bourgeoisie is pursuing. The intended reorientation of German trade is illustrated by German Chancellor Merkel’s visit to China in June 2011 in which she signed a €10.6bn trade deal involving major German companies, Airbus, Volkswagen, Siemens, and others, and agreed with Chinese prime minister Wen Jiabao to increase annual trade by a third to €200bn. For German capitalism to succeed in this changing world the collapse of the Eurozone, the demise of the € and the collapse of the European project would be a disaster. Rather than allowing the disintegration of the Eurozone, Germany needs to keep the EU as a home market and mould it to the needs of German capital accumulation. Similarly the common currency must be sustained. The use of the € in the Eurozone alone is estimated to save German capitalism at least €10bn annually in currency charges and, of course, stimulates Eurozone trade (10). The currency now operates as a global reserve currency and is used for international trade, which gives capital based in the Eurozone a significant advantage in international trade. It also enables the Eurozone to drain a section of global surplus value into the zone through the control of currency issue by the central bank, as discussed below. While all this appears perfectly obvious, the apparent ambiguity of Merkel and her henchmen in the face of the Euro crisis needs to be explained. 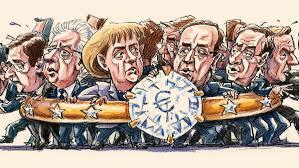 The crisis has shown the € currency cannot succeed as originally conceived. As the ICT has repeatedly pointed out, economic and political union are required to sustain the currency, and this was the direction in which the Eurozone would move under the pressure of economic forces (11). Although German politicians have realised this they have hesitated. They feared that the costs of remoulding the peripheral countries to the needs of German capital would ultimately be borne by Germany herself. Germany would become the paymaster for the transitional phase which is why we have heard so many complaints from Berlin about the Eurozone becoming a “transfer union.” The German bourgeoisie have the experience of incorporating former East Germany fresh in their minds and do not wish to go through a similar experience with the PIIGS. It is estimated that the costs of incorporating East Germany into West German capitalist regime amounted to approximately €100bn annually and held back the German economy for over a decade (12). This needs to be compared with the more favourable process of the integration of the Eastern European states, particularly Poland, the Czech Republic and Hungary where the costs of structural changes and reduction of labour power costs was loaded onto the national bourgeoisie and the working class of these states. While the German ruling class is clear that the Eurozone needs to become more integrated, capital restructured and the cost of labour power needs to be cut to the bone, it wishes to avoid shouldering the costs of these reforms. Instead it has hoped to load the costs of these changes onto the states themselves along the lines of the Eastern European experience. The strategy of the German ruling class has been to use the crisis as a cover for pushing the costs of reforms they deem necessary for the Eurozone peripheral states onto those states themselves, via draconian austerity programmes. Once this austerity has run its course further integration of the Eurozone can take place. However, the austerity programmes have produced sharp falls in the GDP of the PIIGS (13) and sovereign debts so high that more austerity will simply produce a downward spiral to economic collapse. If the Eurozone is to survive there must be economic integration and sharing of the debts, that is to say the Eurozone must become a “transfer union” like a genuine federal state. If the Eurozone were a single state its budget deficit and debt to GDP ratios would be far better than those of the US or the UK. This means, of course, that Germany’s enormous trade surplus must in some way be shared out with the deficit countries. The German ruling class has realised this but are determined to exact the highest price from the peripheral states. The implementation of the austerity regimes has been accompanied by an ideological campaign against what the German ruling class see as the delinquent states. These states are castigated as responsible for what has happened to them, their ruling class are vilified as feckless and dishonest and their working classes are lazy and workshy and wallowing in state benefits and early retirement. All this has lit a flame of residual nationalism in these countries which, of course, is a threat to the entire process of integration. However the severity of their economic situation is snuffing this out and forcing them to go along with the German plans. The local ruling classes can see no alternative. Austerity has meant a frontal attack on workers’ wages and a reduction in their indirect pay which they receive from the state, an attack which is without precedent since the Second World War. This onslaught has produced massive increases in unemployment and sharp reductions in living standards. Unemployment in the Eurozone as a whole is 11.7 % of the workforce which equates to 18.8 million workers; approximately equal to the combined populations of Portugal and Austria! In the bailout countries the percentages of unemployed are all much higher, Greece 26.8%, Spain 25%, Portugal 16.5%, Ireland 14.6% and Italy 11.2%, while youth unemployment is above 50% in Greece and Spain. The state sector employees have suffered the brunt of this attack with redundancies and direct pay cuts (14). In Portugal, Ireland, Greece and Spain direct pay cuts for government workers have been 5, 10, 5.8 and 8.5% respectively while in Italy there has been a pay freeze. Minimum wage reductions have been imposed in Ireland and Greece of 11.5 and 22% respectively. Holidays and bonuses have been cut, pensions have been cut and pension age increased. At the same time state regulations affecting protection of workers with regard to dismissal, redundancy and other rights have been removed. The austerity regime has also brought a restructuring of national capitals in the PIIGS designed to enhance competition in the Eurozone and benefit the stronger capital formations. State assets are being privatised and sold off to international capital. Part state owned industries, such as energy production and distribution, are having their national protections removed. State protected industries, such as utilities, pharmacies, taxis and others are having their state protections removed to make them more competitive. State subsidies to industry are also being withdrawn. An example of this is the withdrawal of subsidies by the Spanish state to the Asturian coal mines which will ultimately result in the closure of the mines. The size of the state is being reduced and the state structures themselves are being reformed. Government departments are being trimmed by a massive programme of redundancies, while state workers are losing benefits, such as bonuses and holidays. At the same time general taxation, via taxes such as VAT, is being increased. What has been described above is not, of course, limited to the countries of the Eurozone periphery but is also a description of what is occurring, to a lesser extent, in many other EU countries, notably the UK. It represents a general strategy of the European bourgeoisie for transferring the burden of the crisis onto the working class. However, for the so called “delinquent” states of the Eurozone periphery local bourgeoisie is also being forced to give up some of its privileges in the interests of the Eurozone bourgeoisie as a whole. What we are seeing is these states being bludgeoned into shape for incorporation in the greater Eurozone federation. At the end of November the European Commission published a 51 page document which outlined the steps necessary for the survival of the single currency. This document repeated much of what had been presented to the European summit a month earlier and represents the future strategy of the Eurozone bourgeoisie. The document, presented by the Commission President, Barroso, states the Eurozone should acquire the powers of a national government, including a single treasury, the power to tax and to issue commonly backed bonds. There should be pooling of sovereignty, an integrated Eurozone budget and fiscal union. The European summit in mid December took the first real step in this process by agreeing to a banking union. Under this a single supervisory mechanism under the European Central Bank will have direct responsibility for Europe’s largest 200 banks and have the right to supervise the remainder in an emergency. This is to come into force in March 2014. These powers are In addition to the powers granted to the ECB under the bond buying programme, the so-called Outright Monetary Transactions (OMT) launched in early August. Countries subscribing to this programme will have to have budgets and taxation regimes approved by the ECB, while the ECB will have the power to lend directly to banks. This process limits the sovereign states responsibility for budgeting, taxation and banking supervision. It represents a significant reduction of the power of the national state and a shifting of powers to the ECB and the central organs of the Eurozone. This agreement, when implemented, will be the most significant measure of political integration since the creation of the common currency. It represents a further step in the path outlined in the European Commission document presented in November which will eventually see the European commission assuming powers of a federal government operating a European treasury, implementing a European fiscal policy, carrying out taxation, overseeing of national budgets, issuing of bonds and so on, while national governments would become subordinate to the federal power like local authorities. We are witnessing the slow progression towards a European federation with Germany at its head. The implications of this are enormous. A significant shift in the structure of global capitalism is taking place which will inevitably lead to a shift in the balance of power and of global imperialism. The question which must be answered, however, is whether these measures will solve the crisis of European capitalism. Marginal utility is the construction of a value concept which justifies the prevailing class and income differentiations. The existing inequalities based on the exploitation of labour are explained as the undefeatable natural law of diminishing utility (16). Bourgeois economics is fundamentally a science of apologetics for the existing system and is unable to recognise any systemic problems with capitalism. The present crisis is seen as an interruption in a fundamentally healthy system which can be solved by the correct policies. The recurrence of crises and their increasing severity is put down to contingent problems which for some unexplained reason seem to recur more and more frequently. It is therefore not surprising that bourgeois economic theorists are divided as to the roots of the present crisis and its solution. Two broad schools of thought have dominated the analysis of the Euro crisis. The first sees the crisis as the result of reckless borrowing, structural inefficiencies and inflexible labour arrangements. The solution is structural reforms, flexibility of the labour market, slashing state expenditure and balancing the national budget. Needless to say they advocate austerity. The second, who see themselves as neo-Keynesians, see the crisis as stemming from lack of demand. They advocate stimulating effective demand by government spending. Both the advocated solutions are derided by the other school. On the one hand the austerity faction claim that excessive borrowing led to the present crisis and more borrowing would simply make it worse. On the other the Keynesians point out that austerity is causing economies to contract increasing budget deficits and government borrowing, the very things which the austerity school claim caused the crisis. Both groups do agree that the only way out of the crisis is through growth. For the austerity faction structural reforms and labour flexibility will produce growth by attracting capital investment. For the Keynesian demand stimulation will produce growth by increasing economic activity. Both schools of thought have been proved wrong historically, when policies they advocated failed to prevent crises. The fact that both are correct in their criticisms of each other is an indication of the cul-de-sac in which bourgeois economic theory has ended up. The ruling class does not understand either the causes of the crisis or what to do about it. The Marxist critique of capitalism has always attempted to relate the phenomenal world of capitalist crises to the underlying social relations of production. In this analysis crises spring from the contradictions of capitalist production relations, and can be traced back to the problems of the exploitation of wage labour which can only be understood by value theory. We argue, and have explained in numerous texts, that the present crisis is an expression of the tendency of the average rate of profit to fall caused by the tendency of the organic composition of capital to rise. The financial crisis is derived from this. The outlines of an explanation linking falling profitability to the financial crisis can be briefly sketched. Because the reduced rate of profit choked off investment in production, leading banks and finance houses began to use capital which would otherwise have been reinvested in industry, for speculation on housing, commodities commercial property etc. Although these operations appeared to produce a profit, since the value of these assets increased, this apparent profit was not based on the exploitation of workers in production. This apparent profit was based on fresh capital coming into these markets and driving up prices. This produced a bubble in asset prices. Ultimately, however, all profit in the capitalist system is derived from exploitation of workers in the production process. Value analysis shows that for the economy as a whole “total profit = total surplus value”. (17) This was patently not the case and when the flow of capital into these markets dried up, the bubble burst and prices collapsed. Many of these so-called assets which banks held as collateral and on which they based their lending suddenly became valueless, as the profits they were supposed to yield were not based on the exploitation workers in production. The result was an explosion of crisis in the financial sphere. This explosion was, however, derived from deeper problems in the sphere of production, namely the tendency for the rate of profit on industrial capital to fall. The ICT argues that only a massive devaluation of constant capital can reverse the tendential fall in the rate of profit. So far only a minimal amount of capital has been written off, and this was on a small part of the Greek debt. A much larger write off of debt is required to restore profitability. This needs to be implemented not only for Greece but for all the PIIGS. The measures which have been carried out such as the structural changes, slimming of the state and reducing cost of labour power will ameliorate the problem of profitability, they will not, however, solve it. A massive write off of debts is required. It is possible that the European bourgeoisie is planning to do this once the austerity regime has run its course since it is clear the debts cannot be repaid. The situation is analogous to the South American debt crisis of the late 80’s which was resolved by a swapping of South American debt for US treasury bonds, the so-called Brady bonds. Under this arrangement creditors were forced to take massive write downs of their debts, some times of up to 70%. The centralisation of economic power in federation would give the European Central Bank more control over the European crisis, and the ability to enforce a solution along these lines. It would also make devaluation of the Euro simpler and enable exports to become more competitive and growth to resume. While it is possible to outline the economic forces which are driving the actions of the bourgeoisie, the path they will follow is only speculation. It is, however, possible to predict that all their actions will not solve the underlying problems which have led to this crisis since no state or bloc of states is prepared to devalue its capital sufficiently to restore profit rates while its competitors’ capital remains intact. To do so would be committing economic suicide. A general and global devaluation of capital values is required and this is only likely to be achieved by global war. The creation of a federal European power will change the balance of imperialist power in the world. The EU as a bloc has a higher GDP than the US, but has so far lacked the political strength to fight independently for its interests. As the EU reorients itself economically to the rising Asian powers the US will become a more obvious economic rival than it seems at present and interests will diverge more sharply. The political strengthening of the Eurozone is bound to lead to its strengthening as a pole of imperialism and consequently to conflicts with the US and China. At present the EU acts in concert with the US and provides support to US interventions, for example in the Middle East and North Africa. Interventions which are semi-autonomous such as, in Libya and more recently in Mali, have the support of the US. In the future, however, the EU is bound to act more independently to further its own interests. Integration of the EU is also bound to strengthen the Euro and, in particular, its role as a reserve currency and a currency of world trade. Both of these roles represent a direct challenge to the Dollar (19). Since 1971 the dollar has been a fiat currency backed by nothing but the promise of the US government (20). However, since the dollar has remained the major currency of world trade, particularly the trade in oil and gas, and since the US has sole control of the currency it is able to increase the volume of dollars in circulation to match increases in global trade. This gives the US many advantages particularly the ability to fund its trade deficit and to devalue its debts by printing dollars. It has been estimated the US gains approximately $500bn annually through these operations. The Euro is a direct challenge to all this. Its creation was intended to divert some of the surplus reaped by the dollar to Europe and in the 13 years of its existence it has started to succeed in doing this (21). The US is unlikely to give up the privileges which the dollar gives it without a fight. As the Euro increases its threat to the Dollar this is also likely to become a n important source of future imperialist rivalry. The position of the UK in all of this is becoming increasingly untenable. For decades the UK has adopted a mid-Atlantic position of keeping one foot in the European bloc and one in the US. Whereas its trade interests lie with the EU it has held back from full commitment because of the political weakness of the bloc. It has pretended the EU was simply a trading bloc and actually tried to thwart its political unification by supporting the extension of the bloc as widely as possible. The developments over the last few years have thrown this policy into reverse with the UK government now calling for economic and political unification of the Eurozone. The UK, however, pledges to stay outside such unification. The British ruling class is hopelessly divided on what to do. To leave the EU would be an economic disaster, whereas to fully enter the European bloc would entail relinquishing the so-called special relationship with the US. The US, however, hopes to have the European bloc as an ally in future conflicts and has made it known that it would prefer the UK within the European bloc. Its strategy is to have an ally within the EU acting on its behalf to prevent the EU challenging the existing balance of power and US interests. The shifting balance of imperialist power is a reflection of the shifting balance of economic power. For both the US and the EU the rising figure of the Chinese dragon is looming on the horizon and threatening the global balance which has been in place since the collapse of the Russian bloc in 1989. This is a longer term, rather than an immediate threat. At present a number of poles of imperialist power are consolidating themselves but the formation of blocs which could precipitate another global conflict is still in its infancy. (2) The European Stability Mechanism was established in September. It replaces the European Financial Stability Facility. (7) OECD factbook. Germany FDI stock is the 4th largest after the US, UK and France. (13) Since the crisis broke in 2008 GDP has fallen by 5.5% in Portugal, 5% in Ireland, 7% in Italy, 25% in Greece and 4% in Spain. Apart from the case of Greece this is only about 1/3rd of what occurred in the Eastern European countries. In the period 1989 to 1994 where GDP fell 17.8% in Poland, 21.4% in the Czech Republic, 25.1% in Slovakia and 18.3% in Hungary. (14) Private sector workers have suffered strategic defeats in the 80s and 90s and their resistance has been undermined by globalisation and shifting production to areas of cheaper labour power. (15) Reported in Financial Times 31.7/2012. We should note that the costs of supporting the unemployed fall to the state and would not be included in this calculation. (17) See, for example, RP 62 “The tendency for the rate of profit to fall, the crisis and its detractors. (20) This has been the case for all currencies since 1971 because up to that date other currencies were backed by the dollar which was backed by gold. (21) In 2011 26% of the world’s currency reserves were in Euros. (Frankfurter Allgemeine Sonntagszeiting 26/6/11. Quoted in RP 59 “German capital and the Euro crisis. Limits to an expansionist project”.